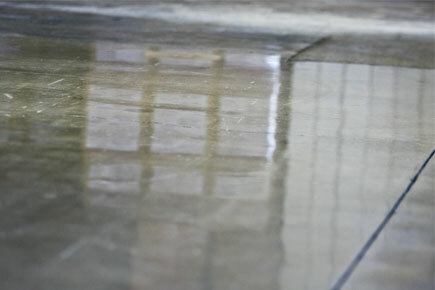 Polish Your Concrete To A Beautiful Shine! The SNAP! Diamond Disk polishing system, if progressed throughout the entire system, will leave your floor with a shine for years to come. This system is a Do It Yourself system and requires no former education on Concrete Polishing or Grinding. Instead of having to replace the entire tool due to wear and tear, simply order a blade replacement kit and save money. The SNAP! Polishing System is completely unlike any other on the market today. The system walks through a series of steps of polishing. The SNAP! system is a polishing only technique, and is used to restore old surfaces to a brilliant shine. 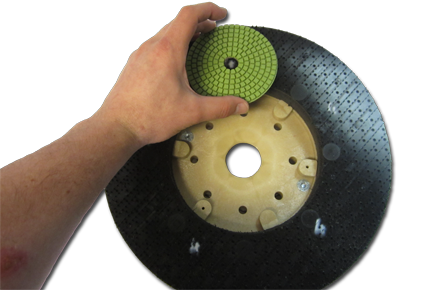 Once completed, the auto scrubber would be run with traditional brushes or pads for daily cleaning. Depending on traffic & wear, operators will refit the machine with SNAP to maintain the shine. By progressing through a series of increasingly finer abrasive grits, the surface of the concrete begins to close up, resulting in a brilliant shine. Our various grits also allows the customer to choose the final result of the floor, and maintain it themselves. The SNAP Polishing System is new application of diamond abrasive tools ideally suited for use on our battery powered scrubbers. By eliminating the need for specialized equipment and harsh chemicals, our system makes polishing concrete floors a "Do it Yourself" project. If so - SNAP! is exactly what you are looking for. SNAP! 's 6 Step System is easy, safe, and DIY! No need for chemicals at all to clean your floors with these Diamond Plated disks, though we suggest using PowerCat Formula 275 Concrete Densifier if it hasn't already been applied to the floor.